One of the things that we knew was going to be a bit of change for us when we moved into our house was the change in the amount of closet space that we had. Yes, we were gaining a large amount of general storage space, but we were used to a walk-in closet in our apartment that held all of our clothes. Our new master bedroom closet had one shelf and one bar and not a lot of room for the clothes of two people who own a lot of clothes. We knew from the first moment we had our offer accepted on the house that this closet would be near the top of our to-update list. One night about 2 or 3 nights after we moved in - at the end of June - I decided to tackle this project. I took a hammer and a crowbar and I pried out the shelf, support and bar. I was left with the wooden piece around the inside of the closet, and quite a few cracks in the walls. I used paintable caulk, and sealed up all of the cracks and gaps in the corners of the wall, along the trim, and around the wooden piece. Once the cracks were sealed up, I used an oil based primer to prime the entire inside of the closet - including the inside trim and the wooden piece around the inside where the shelf used to be. Then, I used Behr paint (color matched to Benjamin Moore's Simply White) and painted one coat in the closet - on the walls, trim and the ceiling. Then, I purchased a ClosetMaid kit - the ClosetMaid Impressions 16 inch in Dark Cherry - and installed it into the closet. My aunt helped me build the shelves while she was here to help me paint, and then I finished installing them the weekend after she left. I also purchased an additional clothing rod so that we would have the stacked shelving in the middle of the closet and two rods on either side of the shelving. The rods on the right, and the bottom four shelves, are for me, and Josh has the left side and top four shelves of the closet. In order to install it, I removed the closet doors - which were sliding doors that made it very difficult to get into the closet. As of today, we are awaiting new closet doors that we have hired a contractor to install for us. They will be french doors that allow us full access to the closet. 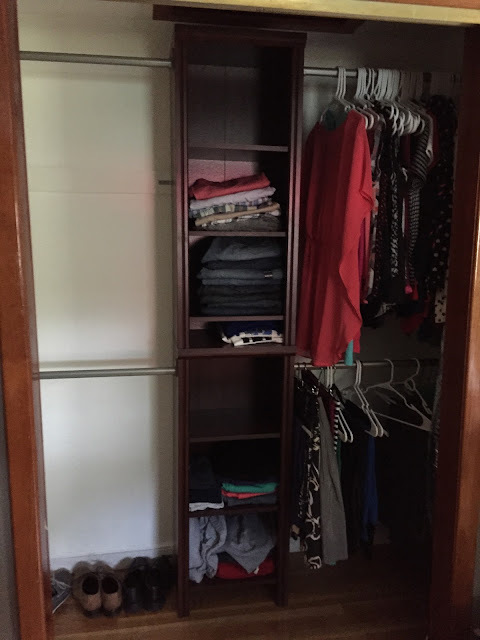 While we still have clothes that flow into other closets, this organizer has allowed us to maximize our use of space. We are definitely planning on adding these organizers in closets in our other rooms, and eventually into our front half closet as well. It was an easy fix with a huge reward - a place to keep our clothes! - and we love that the organizer is sturdy and matches well with the style of the home. Have you installed closet organizers into your closets? Rearranged your clothes storage space with a little bit of paint and some new storage units? I'd love to hear about how you managed your clothes storage! I LOVE hearing about the house Sara!!! !